The Campgrounds is close to everything in Boone and only 15 minutes away from Ames and Iowa State University. We are also conveniently located within 40 minutes of the Des Moines metro area. Local attractions in Boone include Ledges State Park, the Boone Racetrack, Boone and Scenic Valley Railroad, and many other attractions. Pre-registration can only be done online. If you do not pre-register online, you can camp IF a site is open. Campers who do not pre-register must complete a registration form and submit payment in the drop-box located at the Shower House. Fees include use of shower and bathroom facilities and dump station usage. 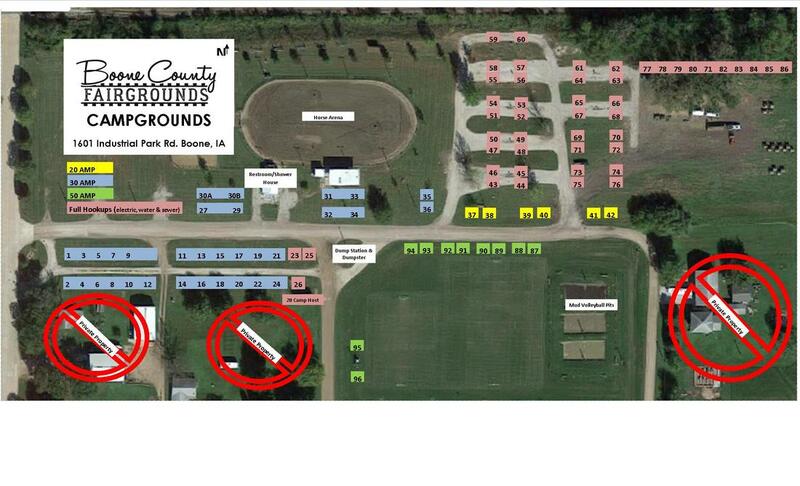 Cost for using the dump station if you are not camping with us is $10. Please call ahead at 515-432-5899, as our dump station is locked at all times. Cost for showering on site, of you are not camping with us is $5/person.